When you've got a flash drive with the capacity of an articulated lorry and performance of Lamborghini it makes sense to plug it into an interface designed for such devices. This is exactly what OCZ have done with the Throttle, ditching the bandwidth limited USB2.0 interface in favor of the beast that is eSATA. This has resulted in a flash drive that not only outperforms some of the fastest USB drives on the market by a factor of at least two, but can also give many SATA hard disks a run for their money. Of course there are certain down sides to adopting this fairly 'new' technology; the main being that you're probably unlikely to come across any other machine with an eSATA port. For this reason OCZ have provided the Throttle with a USB interface and cable that can still outperform some of the best USB drives on the market, but does come at the cost of having to carry a spare USB lead around with you. It would have been nice if OCZ could have integrated a proper USB connector into the Throttle, but with the device already being a little bit on the pudgy side it's probably best that they didn't. Another unfortunate factor is that a standard eSATA interface doesn't carry power. Once again the trusty USB cable comes into play here, enabling the Throttle to obtain its power from a USB port while still operating at full speed on an eSATA interface. Thankfully manufacturers are starting to see the importance of providing power over eSATA, with MSI leading the pack by releasing a number of Motherboards and Notebooks that can give the Throttle the juice it needs without the additional wires. 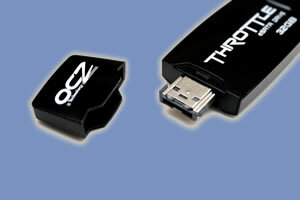 - File transfer speeds faster than a USB drive with a rocket up its bottom. - Support for unpowered eSATA interfaces via provided USB cable. - Support for USB when eSATA not available. - Only a few quid more than an equivalent USB flash drive. - A bit on the large side in comparison to most USB offerings. Thanks to OCZ for sending the Throttle in for review. Discuss this review in our forums.